A very long day is now coming to an end and we are finally all settled in our room on 8 South. 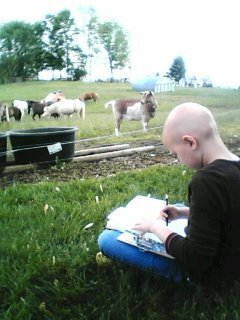 I'm certain by now that Heaven's new Angel, Allie, is also settled in her eternal home. 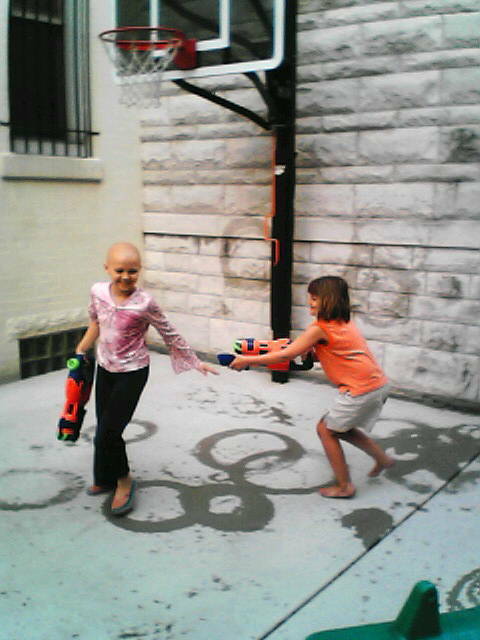 Allie was born within weeks of Christi's diagnosis and also treated for Stage IV neuroblastoma at Columbus Childrens and then at MSKCC in NYC. This beast is so evil! Our thoughts and prayers are with Allie's family. 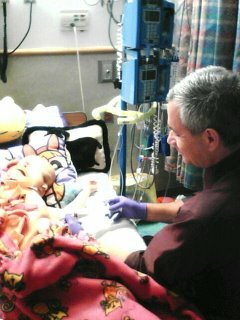 Tonight, as I type from beside Christi's bed, she is receiving yet another platelet transfusion. (Yes, she received one yesterday too.) Early this morning I knew I was taking her for her blood transfusion, but I really didn't expect things to end up this way. I figured that unless the blood bag ruptured and they had to start over by re-ordering, as happened yesterday, we'd be out and off to the zoo by the afternoon. All too soon this 103 fever hit, which isn't budging at all, and which made the fact that only one unit (instead of two) of blood was ordered seem pointless. I think the wonderful NP Pat said, "Since she's going to be admitted anyway, she'll have plenty of time to get that other unit of blood." Christi spent nearly the entire day curled up in a ball, dozing off and on and feeling miserable. Caroline tended to Shayla back at Ronald and at Barnes and Noble and then came to the hospital with a suitcase packed with our things when I called for her about 4:00 PM when we were given a room. So tonight she ends the month exactly the way she started it, by receiving another life saving transfusion. Below are some pictures from last week. The Hank collection is Complete! UGH!!!!!! I don't know if I should scream or cry!! Maybe I'll do both soon! She's got a fever! I'm posting asking for divine intervention that the fever breaks and we're back to the Ronald Hose this afternoon after she finishes this blood transfusion. Christi was up so late last night literally chasing her sister and other kids and sweet Volunteers around the Ronald McDonald House's incredible new playroom. She was feeling incredibly well, even though her counts told me she shouldn't be. At bedtime, Christi asked to have me tape record and analyze her reading since she is one of the "students" I'm doing an indepth case study on for my current OSU class and I wasn't able to since we were separated last week. She read passage after passage for me and answered all of the comprehension questions, even at the high school level- totally amazing me with her high grade level of reading accuracy and c omprehension. She was up reading her own "Hank the Cowdog" book until at least 11:00 PM so I wasn't surprised when I woke her up and she was still sleeping or that she was so cold because I knew she needed blood. What did surprise me is that she asked to ride in her stroller instead of walking and she was freezing in the very warm temps outside and she's been curled up asleep at the hospital the entire time we've been here. After Dr. Maris examined her and I told him that we intended to fly back to Ohio on Friday, as her ballet and jazz recital was coming up very soon - she spiked a fever. @X&*!X$*&!! Prayers appreciated. Despite having blood counts which have rapidly bottomed out (ANC zero, white count 0.2) and needing a platelet transfusion this afternoon, Christi surprisingly is still feeling very well! So much she asked to go to the Constitution Center this afternoon. (And thanks to Tim for offering us a ride downtown, it was in what turned out to be a wee bit of a convertible ride with the top down for the last block! After visiting and sharing that incredible place with her teacher, we went and saw the Liberty Bell and admired Independence Hall from both sides. As always, not wanting to get in a taxi ("I don't think they even have to have drivers' licenses," said Christi) we took the city bus back. She also needed a blood transfusion today, but we talked them into waiting until tomorrow- so that's how we'll spend the morning hours at CHOP tomorrow. 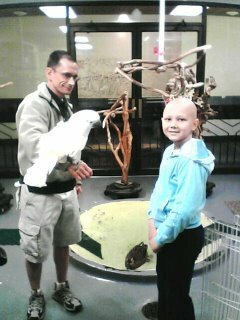 With divine intervention, she may feel well enough to go to the Philadelphia Zoo when her blood transfusion is over as she has been hoping to do. 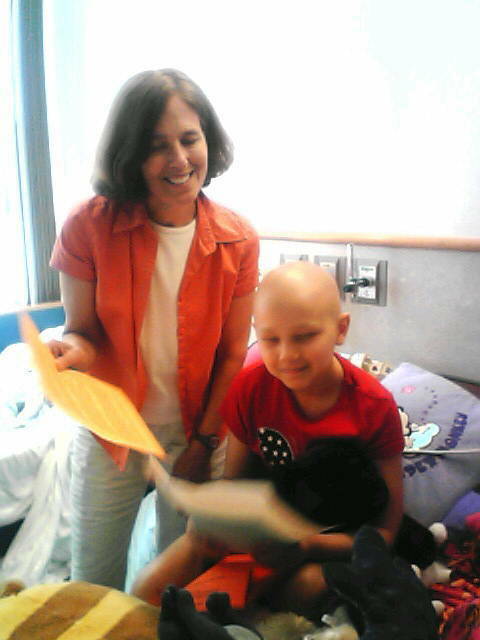 When Christi finally woke up, Mrs. Smith presented Christi with her grade card in her hospital bed and told her she was now a 5th grader. Christi was happy and it probably comes as no surprise that she received straight A's in reading all four quarters. We thank Mrs. Smith for being a fabulous teacher and we are so fortunate that Christi was her student this year (just like Shayne was also her 4th grade student many, many years ago). Shayne gave Christi the dreaded shot, unloaded us at Ronald and then left for Ohio. (I missed him as soon as he left!) Caroline and Christi conducted very cool science projects back at the Ronald House. Tonight the girls briefly used the squirt guns at Ronald to help cool off as the temps are in the high 80s. 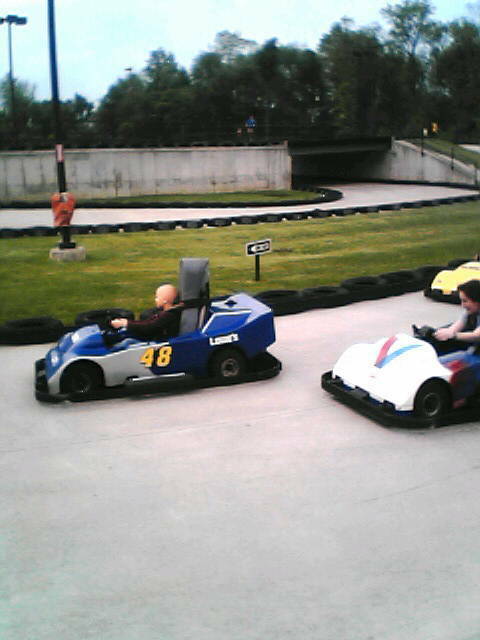 When I last spoke with Shayne all was going well with his travels and he was nearing the Ohio border. I hope the holiday traffic was kind for his entire 500 mile journey home. As always "Thanks" is a very inadequate way to express the blessings you have lovingly and generously bestowed upon our family during Christi's journey over the past 3 3/4 years. Please know we are filled with gratitude and appreciation for lifting Christi up in prayer and for supporting and loving us during these challenging times. We hope you all had a nice Memorial Day. God bless you. A CHRISTI SCARE: "Mom, there are two bumps on my head." (Oh, no! My heart fell.) Trying to act casual, I walked over to where she was playing and discovered two mosquito bites. Whew!! (The past two nights, Christi & Shayne walked back to the hospital at dusk so she must have picked them up then. Shayla and I were also out late last night returning from the Bubble House with "the team" and Shayla has them on her legs- she'd probably have them on her head if it were bald too. PS: The picture of Dr. Maris transplanting the stem cells back into Christi is now on the blog (May 26, 2006) if you'd like to see how it was done. 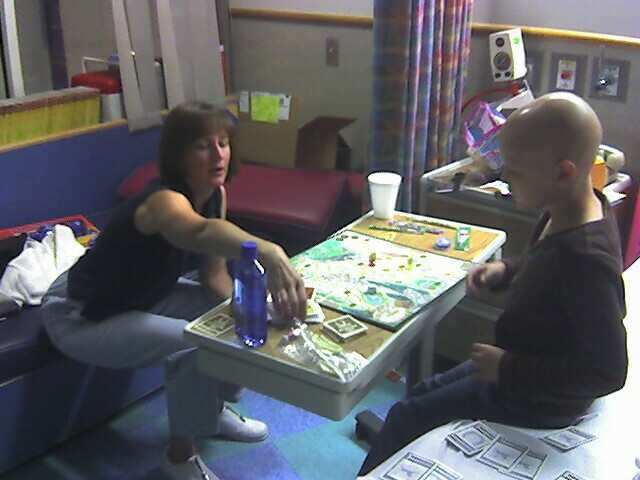 Just so you know....Angela is at the RMH with Shayla and I am at the hospital (day 8) with Christi. Since Angela is not here to edit my post I figure I am free to take a little creative license. Here is what I remember from our day at the art museum-The Barnes. It all started at the hospital when I stepped out of the shower and asked for my shorts and it ended with a broken vase at the art museum, but before I can tell you that story I have to tell you this story.... Christi and Shayla both wanted audio tours at the Barnes. Too much information at times!! Turned out both girls loved it and learned so much, however, as with most art museums there were many paintings of nudes. Needless to say, this put Shayla's inquisitiveness into hyperdrive. "Dad, why are so many of the girls naked?" "Why did that artist only paint big booties?" and on and on. Finally she asked, "Dad why is it art if they're naked?" I replied, "I don't know why it's art if it's hung on a wall, but not when I asked for my shorts this morning." 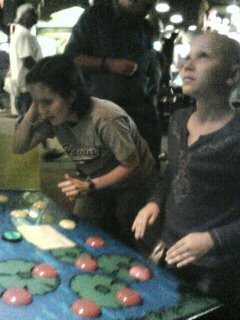 It was decided that after doing the entire first floor of the museum that we better quit while the girls were still having fun. They have been to many different art museums: The Getty, Guggenheim, MoMa, The Met (a lot), Chicago, most of Ohio's (Toledo, Cleveland, Dayton, Columbus, & Cinci.) it is always the same. History has taught us that it is better to leave them wanting more than to overstay our welcome. I am always tense with kids at the art museum anyway and it is even more precarious when they have lost interest. 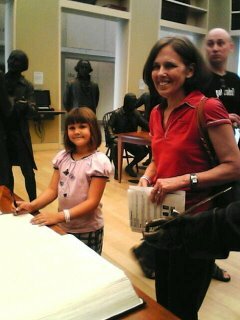 (A docent only had to remind Shayla once not to touch the art). So Angela and I agreed that she would zip through the second floor and I would take the kids to the gift shop. I was returning the audio tour and collecting our stuff from the locker when I heard a huge crash. Yes-I had told the girls to wait for me in the gift shop and there was little doubt that I had just bought a very expensive glass something or another. Well, when I arrived on the scene Christi and Shayla were standing over a now shattered hand blown vase (VAZZZ). Christi quickly admitted guilt and I just as quickly assured her that it was spilled milk and nothing more. Their remorse lasted another 1.5 seconds and they were back to figuring out what trinkets mom was going to buy them. It's great to be care free isn't it? We were moved outside rather quickly once Angela arrived. Christi designed a scavenger hunt on the grounds. You can provide your own editorial humor. Items to be found: a crooked stick, three types of leaves, two types of flowers, a squirrel, a straight stick one foot long, and two nuts. I am busten' out of here tomorrow and will spend the day driving. Tomorrow is the dreaded shot day for Christi so as soon as I give that to her, I am on the road. Thank you for checking on Christi-I will take another 30,000 days just like today. That should get her to about 80 or so. Christi's counts are now starting to drop, which is to be expected. She was still feeling well this morning so on her six hour "get out of the hospital" pass, we drove to the city limits and spent over three hours at "The Barnes". Much to our delight, the girls throughly enjoyed this incredible art museum featuring work of our favorite periods (impressionist and post-impressionist) and arisits (Manet, Renoir, Gaugin, Degas, Cezanne, Matiss, and Seurat.). After enjoying the intimate museum-only open on the weekends and often selling out months in advance, the girls played on the spacious and lovely grounds where we earlier had a picnic. Christi created a scavenger hunt and the girls beat Daddy- not that anyone is surprised. 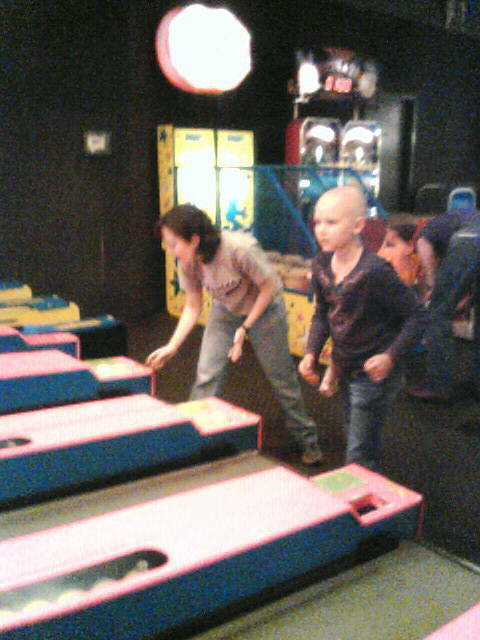 Hours later, the girls wanted to come back to the wonderful Ronald McDonald House to play together before Christi and Shayne have to return to spend yet another night at CHOP. We praise Him that all is going according to plan and Mrs. Smith shall arrive here before 7:00 AM. (We're very happy about having her spend the week with us; yet, sadly that means Daddy is driving back home tomorrow.) Christi counts should continue to fall. I expect her to need both blood and platelet transfusions on Tuesday and it's not too early to start praying that she avoids a fever this week. 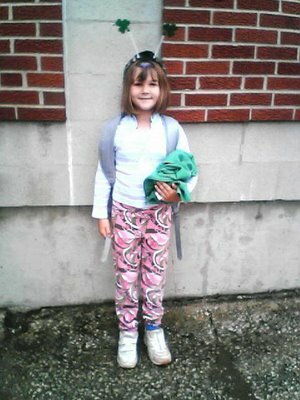 A fever would put her inpatient for ten days and would mean that she would miss the "Poker Run" fundraiser for the Ronald McDonald House and also her ballet and jazz recital. 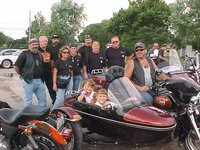 Got a motorcycle, sport car or just looking to head out for a good cause? 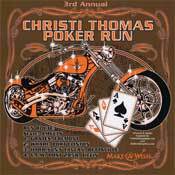 Come out to the 4th annual Christi Thomas Poker Run and maybe take home the $500 top prize sponsored by the "Friends of Christi"! Registration at the Tiffin VFW (10:30-Noon)Leave for first stop (Fatheads in Republic) at Noon. Prizes: $1,000 in cash prizes to be given out. All proceeds will go to the Philadelphia Ronald McDonald House, the Thomas team's "Home Away From Home". If all goes as planned, Christi will be on hand and will lead the parade through Tiffin. Carry Out dinners available. 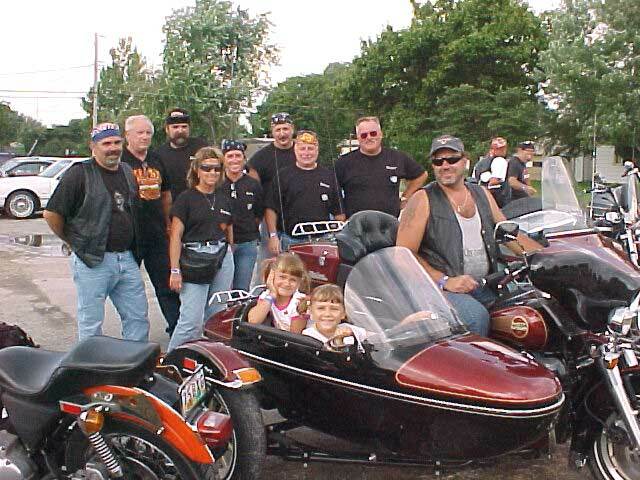 (Picture 2004 Poker Run- Christi & Shayla with the generous "Friends of Christi"
Thankfully, her urine cleared and her counts are great! Christi was thrilled that they unhooked her from the IV pole and the six hour pass allowed us to walk through the lovely UPenn campus on our way to the movie theater where we giggled at "Over the Hedge". Next, we ventured to the Ronald House for refueling (food) and for playing. We're still here and the girls are having a blast. I overheard Shayne tell his mom via phone, "I haven't seen Chrsiti feel this well for at least a month." I couldn't agree more. 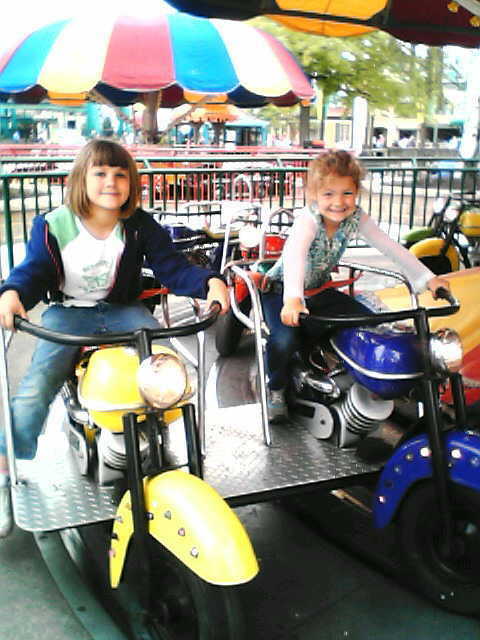 We decided that we'll try to go to the zoo later this week when it shouldn't be as crowded and when Caroline is here! (Doug & Caroline took Shayla to the zoo many times when we were off with Christi and they were babysitting.) The new multi-million dollar tiger exhibit is causing large crowds. With Christi minding the heat, we didn't feel it best to try to go this weekend. I can't believe the difference in how she is feeling today. She played all morning with Shayla and we enjoyed a family game of Cat-opoly (an impressive spin-off of Monopoly featuring species of cats, interesting facts, charming details) a fellow OEA member shipped here for Christi and Shayla. (THANK YOU!) While she was playing with Shayla I overheard her say, "Dr. Maris is just like mom when you're throwing up. He rubs your back." She was so sick yesterday I can't believe she remembers him doing that. I myself was taken back by his loving gestures. God, please bless sweet Dr. Maris. Counts expected to slowly fall and then bottom out on Thursday, June 1st. Our prayers continue that the stem cells quickly engraft and that she soon recovers and is back home next Friday as planned. Sorry no pics. We're again experiencing tech challenges. Hopefully, it'll be worked out soon. Between noon and 12:30 PM this afternoon, the wonderful Dr. Maris very slowly pushed four large syringes, containing Christi's own dark red stem cells, back into her body through her mediport. As Dr. Maris told me, they used the least amount possible to restore her life (2 million cells, approx. 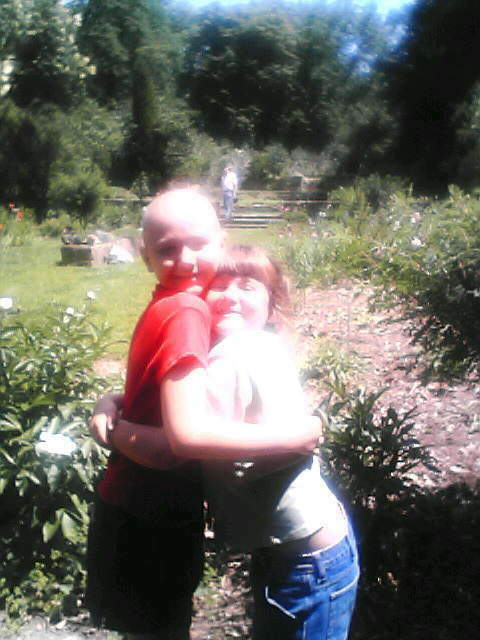 ), but because she's so big now that required two of the bags from Sloan Kettering which were harvested in March of 2003. I told him I appreciated CHOP using the least amount possible as we know of others who used all of theirs with their first transplant and then didn't have any more for other treatment options when they were needed. He told me that he'd get me the final calculations of what remain, but he thinks Christi has two more bags from Sloan-Kettering, two more from Columbus, Ohio and one rescue still frozen out in Los Angeles. ("They're in the bank," he joked- well as well as the ever serious Dr. Maris can attempt a joke, hee hee.) Regardless of what may be in the freezer for future treatment attempts, we need THESE to kick in and work before we can even begin to worry about ever needing to have any other treatments. Christi said they felt very cold and that they tasted horrible. 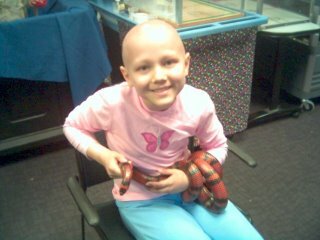 While talking with her friend, Josh, on the phone she said, "I'm not feeling the best because I got my stem cells back today." That was an understatment. She had a challenging thirty minutes. She vomitted three times and then slept for three hours after the infusion. Thanks for lifting her up in prayer. All is going fine - well, except I forgot about the odd smell that should linger for a few days. Can you say creamed corn? Yuck! I learned that she will not be discharged until Monday. I thought it was Sunday and I also learned from Dr. Maris earlier today that she can have some weekend passes and she's planning for our family to go to the zoo he told me. Now, however we've been informed by yet another visit by Dr. Maris late this afternoon that red blood cells have been detected in her urine. This can happen as a result of the preservative used with the stem cells, or it could be her own cells breaking down. Regardless, constant hydration must continue until it stops. If it continues tomorrow, she'll not be allowed to have a six hour pass. Keep your fingers crossed we make it to the zoo to see the new tiger exhibit. I've only been here a day and I'm anxious to get out already; I can only imagine how Shayne feels after being in here since Sunday not to mention Christi-dragging this IV pole along! Shayla Humor: The nurse just started dripping Christi's GCSF through her IV. (She'll get her neulasta on Monday, but this needs to happen as a result of the stem cells infusion to help get those cells to start working.) As the nurse was leaving she asked if we needed anything. Shayla responded without missing a beat, "A puppy and a yogurt parfait thingy without the yogurt in it." That amazing nurse is checking in it - a fruit cup that is! Christi Humor: Although not feeling very well today, Christi is still able to play a game with the nurses to earn imaginary points. When they finish taking her temperature she pushes the button on the throw away part aiming it at the nurses trying to hit them and making them duck and giggle! What fine, talented and good natured nurses working here at CHOP- and dodging Christi's shots. Thankfully, she's not very talented in the aiming department and they're lightweight plastic! Christi & Shayla are happily playing here in the hospital room, Shayne's off to meet a client here in Philly for lunch (small world, eh?!) and I just snapped this picture of the lovely ceiling tile Christi created earlier this week. (Siamese mama cat nursing her kittens) She's had many in to check on her this morning. Premeds will begin soon. 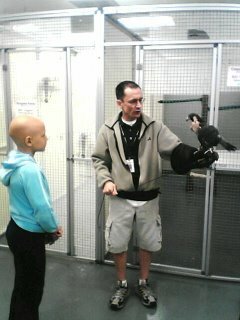 Shayla is quite the amazing little trooper. Being delayed for hours at the airport last night before they cancelled our flight and before we frantically called Shayne to try to get us a hotel room, she was incredible with the entire situation. She loved the hotel room where we spent five hours before returning back to the airport this morning. Thankfully, the storms have passed and we safely arrived here in Christi's room about 30 minutes ago. Christi doesn't look as well in my opinion as she did last Sunday when I saw her last, but Dr. Maris just left and told me everything is going according to the book. He'll be back to infuse her stem cells at 11:30 AM. Prayers are appreciated that they quickly engraft and allow her to live. We will soon be entering the most dangerous time of this trial. Now that I'm here with my camera phone, I'll have some pics posted soon! God bless you all! Shayla and Angela got stranded in Columbus due to weather. We got them booked into the Garden Inn on Hilton points and have them flying to Philly at 5:30 AM. Christi continues to impress me with her positive attitude toward her stay here. She does not complain nor get depressed. She got a little bumbed out when Corrine left today, so I smoothed that over with a trip to the gift shop and the Connelly Library. The dreaded shot arrived today(Nuelasta). Christi will receive that on Monday after three days of G-CSF via IV. The counts should bottom out a week from tomorrow. We are hoping that Christi can stay well enough to head home by then. We are looking forward to visitors that week!! Aunt V-Christi loves her Pillow and sleeps with it every night in the hospital! 11:30 tomorrow: new life will be pumped into Christi by the reinfusion of her stem cells that were harvested at MSKCC a couple of years ago(they survived the blackout) We hope they engraft quickly and they allow her to be a full and active participant in her ballet recital and in theater camp at the Ritz when we return home. No scan will be done for about thirty days so we will not know for some time if this treatment was effective. Right now we must focus on her recovery and reviewing the short list of treatment options along with their eligability requirements. Special thanks to Eden Vetinary Clinic and my ma Joan for taking care of a very sick Buckeye the cat while we are gone. Enough for now. Angela will be back in the reporters chair tomorrow. Thank you for lifting up Gracie's family in prayer. We've grown so close to many others fighting neuroblastoma that it is like they are our own family. Each horrendous loss is heartbreaking. Shayla had a great last day of school!! Finally, Mrs. Rombach can get a break! I broke down in tears a couple of times especially at the end of the day sending some of the 8th graders off to the high school next year. I'm really going to miss the awesome kids, parents and staff members I'm so blessed to work with!! I've not yet spoken with Shayne today. I hope things are going well. I can't get there fast enough. It moves me to tears to even think about the seriousness of tomorrow's stem cell infusion so I ask that you please lift Christi up in prayer Friday afternoon. 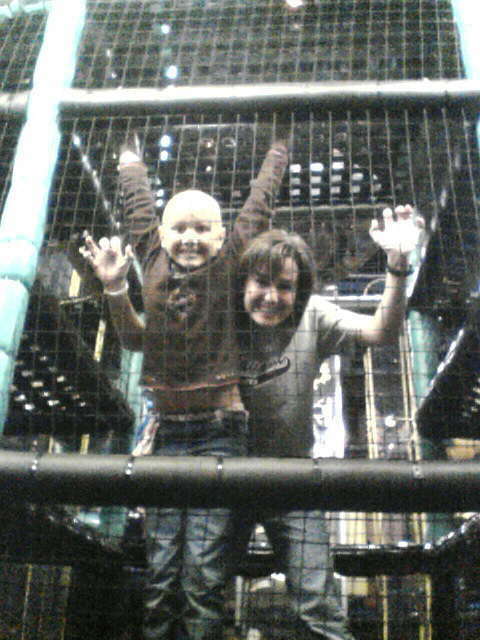 We pray that they quickly engraft, are really cancer free and will re-start her precious life we treasure so much. Although Christi is handling this treatment without any side effects except some mild nasuea, she is not out of the woods by any stretch. Her counts were robust today, however, they should begin to plumet tomorrow. Our options for future teatment are extremely limited. It is daunting that our weapons are limited but we will march on. Today after my jog through Fairmont Park I noticed some statues of people behind the Art Museum. I wanted to walk a bit and rehydrate before running stairs so I took a few moments to read the inscriptions. I particularly liked the quote by American Patriot General Nathanael Greene "We fight, get beat, rise, and fight again". That sounds like my Christi! We had wonderful visitors. Liz came and chatted with Christi and updated us on her boys and Lemonade etc. They are getting very busy with the national Alex's Lemonade stand days approaching. She is very cool and collected coming to the hospital-I don't know if I could do it??? We miss you Alex! Sylvia and her daughter arrived with the emergency ration of window paint. It was really bugging Christi that her window was unpainted in her room. Christi and Michele went right to work decorating. We enjoyed great conversation the entire time. Thanks! Christi's exciting project today was to paint a ceiling tile for the toy room that is getting a makeover. She sketched then painted a Siamese Cat with four Kittens nursing. I will put a photo of it on the Blog as soon as I overcome my technical difficulty with photos. Corrine and I have endured our incarceration by tickling our palates. Today's culinary delights were a bit eclectic-collard greens, rice and beans, fried chicken, and Green Tea Latte. At the rate we are consuming calories, we will fullfill our genetic destinies with no problem. Shayla and I are trying to keep very busy this week to keep our minds off of Christi. Today we went to Cedar Point after school with one of Shayla's school friends who also has a Season Pass. We are counting down the days (and hours) until our plane lands back in Philadelphia. I can't believe how much I've missed her and how I've worried myself sick about her. Just walking into her empty bedroom to put her laundry away this week made my heart fall; I'm so thankful that I can put her laundry away when I know of many others who simply cannot as their children no longer create dirty laundry to clean. Am I really 500 miles away while she's getting a harsh chemo cocktail which has killed others? Ugh, I know the answer and I can't wait to get back to CHOP to put my arms around her in person just as soon as possible! Time with her is so precious! Tomorrow is the last day of school. It will come with mixed emotions. Today I already cried while reading some of the incredible letters my sweet students wrote about my classroom. (I had them write letters to next year's students telling them what to expect in my class.) Seeing the 8th graders, especially, move on to high school made me cry last year and I'm certain I'll spend it shedding some tears tomorrow too. 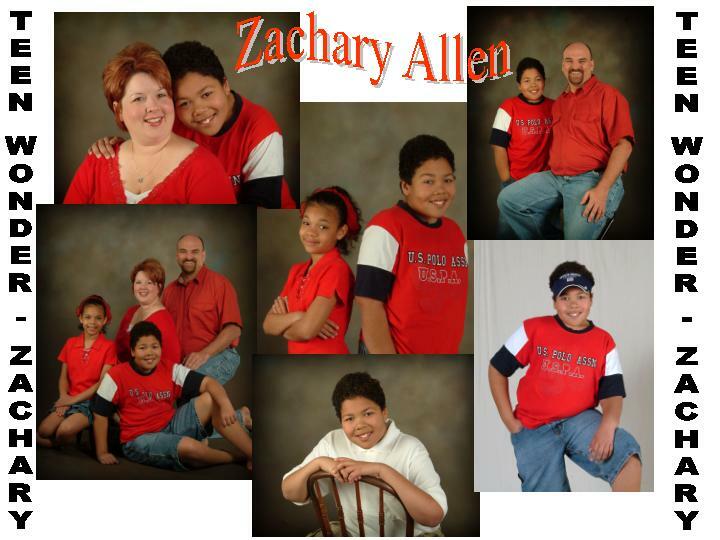 These kids are just amazing!! On the other hand, our suitcase is packed and I'm anxious to get back to Christi! The web cam is great, but it's not the same as being there. Plus the other night I couldn't get her to come to the computer up close so I could see her. I had to hold Buckeye up on my end so Christi had a good reason to come over and let me have a close look at her beautiful face. (laugh) She was too busy drawing in her bed and watching a DVD to care that I wanted to see her! What a hoot! I do think being connected to the IV pole also slows her down. You're very funny and nice. Youre a very funny person and fun to be with. You're a very sweet and cool person. You are good at making up games. You are a very cool best friend. You are a smart one. You're the best friend a girl could want. She is a very funny person when it comes to freinds. You are one of the fairest people I know. You are so cool. You make me fall down. We had a nice meeting with Dr. Maris who is on the floor this week. 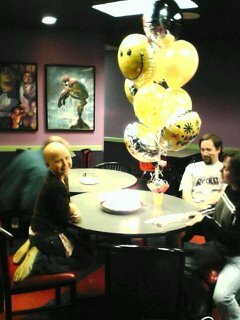 He reported that Christi's bone marrow is still has disease. 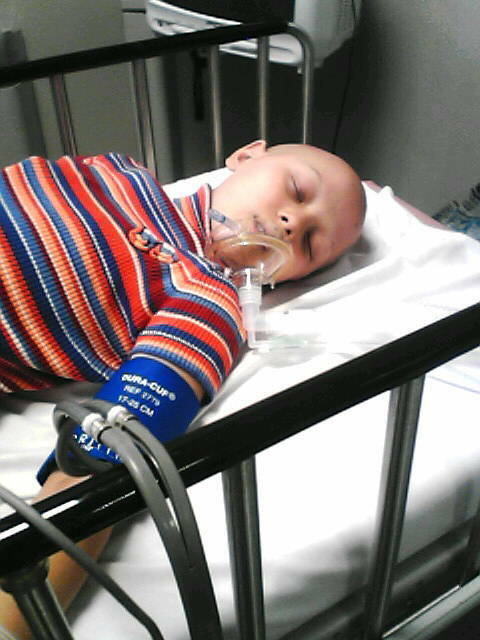 Each side has about 5% of the marrow space contaminated with Nueroblastoma. That bad news was coupled with the good news that her stem cells that were harvested in NY at MSKCC arrived safely and are free of disease which were recently checked at the lab in LA. Speaking of LA, this treatment that we are doing this week was pioneered at Children's Hospital of Los Angelas. 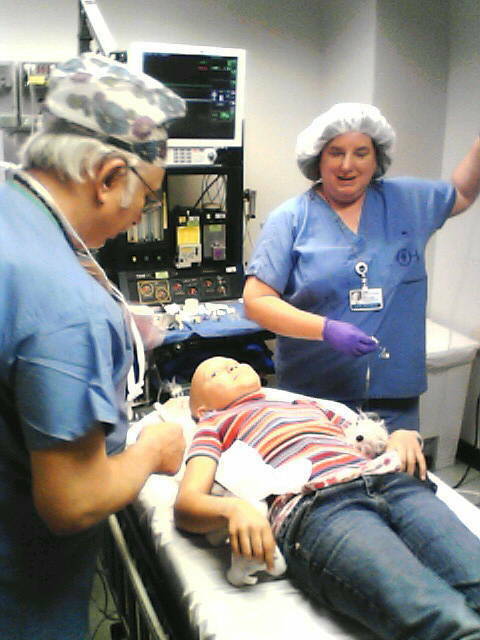 (CHLA) has been a huge engine of inovation in the world of NB. 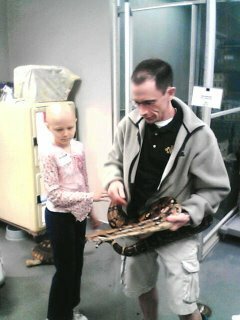 Dr. Reynolds is a giant in this business but has always taken extra special time to consider care options for Christi. He is just one of the team out there that is working to achieve the elusive cure of NB. So this week commences our "west coast" strategy for beating back the disease. IF BSO/L-Pam gives us a good response we will follow that up with Fenretinide. (another teatment strategy developed on the west coast) The latter could provide Christi a good quality of life with little toxicity, however, right now she just has too much disease to attempt it. For the most part Christi was satisfied to entertain herself today. She enjoyed being off the floor for long periods of time-in the Conley Center. At 6:30 they broadcast BINGO to all the kids rooms. 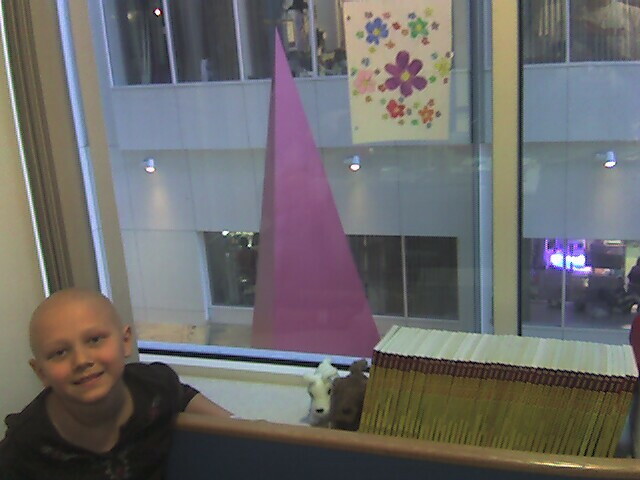 Christi was not content to just play in her room she wanted to go to the West Tower 5th floor playroom and see bingo live-so we did. Then since she wasn't winning she decided that maybe it would be more fun to be a bingo caller. So she did. Piped right into all the rooms was little bald Christi-Bingo Caller. Every good Catholic knows how to shout out B-9. Dr. Maris had Christi sign her own consent to treat document. It says basically that we understand the inherent risks of the treatment and that we are financially responsible. He has increasingly tried to get Christi involved in her own medical care, by informing her of possible side effects of different treatment options as well as where the cancer has spread etc. Really, I think she is content to have us carry this burden. Dr. Maris returned to the room after he had already done his morning rounds yesterday. Of course this gave me a rush of adrenalin because he was not expected. There had to be something wrong......but there wasn't. He wanted us to enroll in a hematological study where the dose of platelets was blindly randomized. We are all about advancing medical science so I enrolled her. If she needs a platelet transfusion she will either get the standard dose level, half the standard, or twice the standard. They are trying to determine the optimal amount to be given in a transfusion. 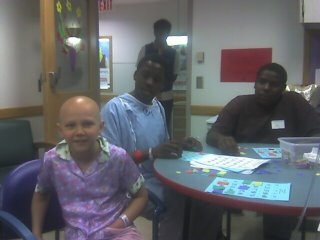 Secondly, Dr. Maris wanted to invite Christi to be a spokesperson for the Lemonade Stand here at CHOP. While this is very exciting because of what a huge event that it is....the timing is bad because of ballet recitals. We are just going to have to get this girl an agent! Tony and I walked to the Ronald McDonald house which is an enjoyable stroll through the campus of Penn (with a Starbucks stop on the way). We both commented on how enjoyable it is to have the cultural diversity of a campus community. CHOP also has its own diversity. 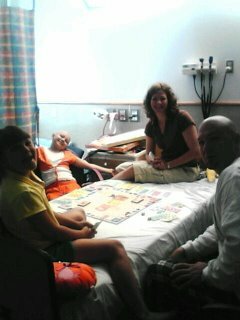 When I returned to the hospital and was riding the elevator back to the 3rd floor some interesting characters joined me. A heavy set women with her sister and her daughter were joking around. The sister says to her niece "Honey your mamma is so big that she is on both sides of the family" "She's so fat that someone said 'dis chilly outside' and she went and got a bowl" and on and on the monlogue went. 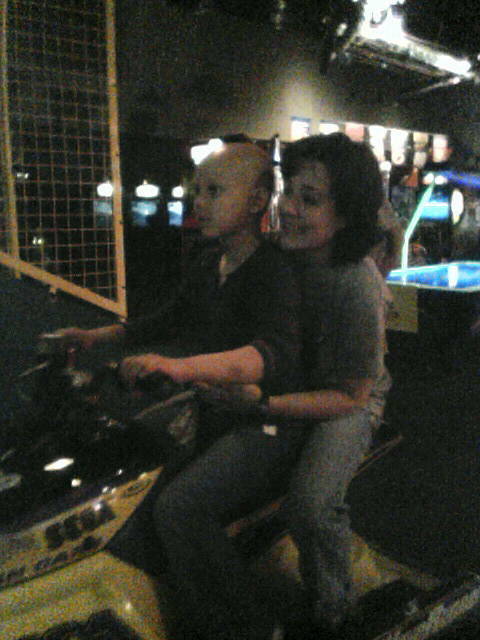 I was still laughing when I got to the play room where Christi hung out for the entire day with Corrine. 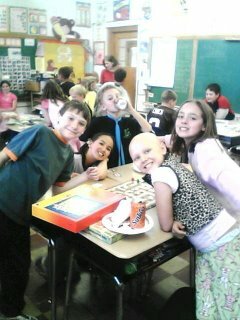 They painted and played games. Corrine is crafty so she got along just fine in that arena. For me the upside is to just sit and visit with a cousin. Who takes the time to sit and reminisce with family? Let alone for several days. 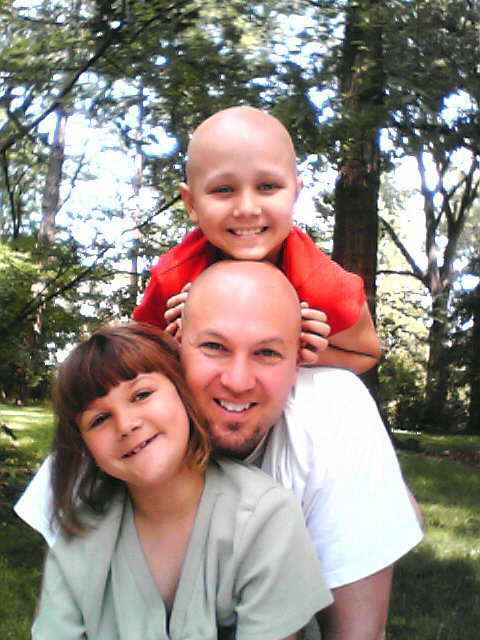 It is one of the small gifts that cancer offers-taking time to be connect with family. We spent a lot of time talking about grandma "Bertha" Thomas. She was a very interesting charactor in our childhood. The term frugal was defined by grandma. Thanks for tuning in and continuing to lift Christi up in your thoughts. Earlier when I called, she was being whisked off for a chest X-ray to set a baseline. In order to start the trial, she needed to have a Hgb. of "10". 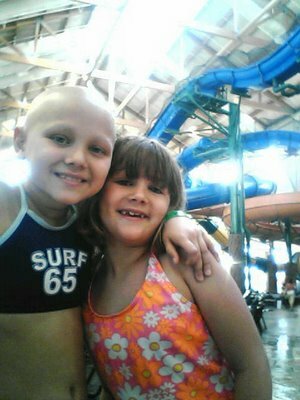 Christi's was only 8.1 so they tranfused her with packed red blood cells last night. (Thank you, once again, blood donors.) 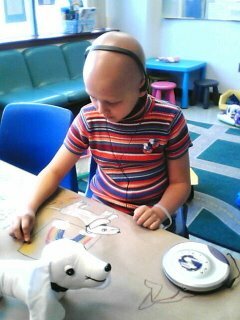 Her other counts were low, but okay at: 47 platelets, 4.4 white with an ANC of 2,552. One drug she'll be infused with is buthionine sulfoximine (BSO), which sensitizes the cells to alkylating chemo agents (melphalan). They are exploring the molecular mechanisms by which BSO kills neuroblastoma and the mechanisms by which BSO enhances alkylating agent efficacy. Based on the pre-clinical studies they have carried out a clinical trial of BSO and melphalan for neuroblastoma and they saw some remarkable responses in that trial, which has led them to conduct other clinical studies to understand how this unique drug improves cancer cell killing. 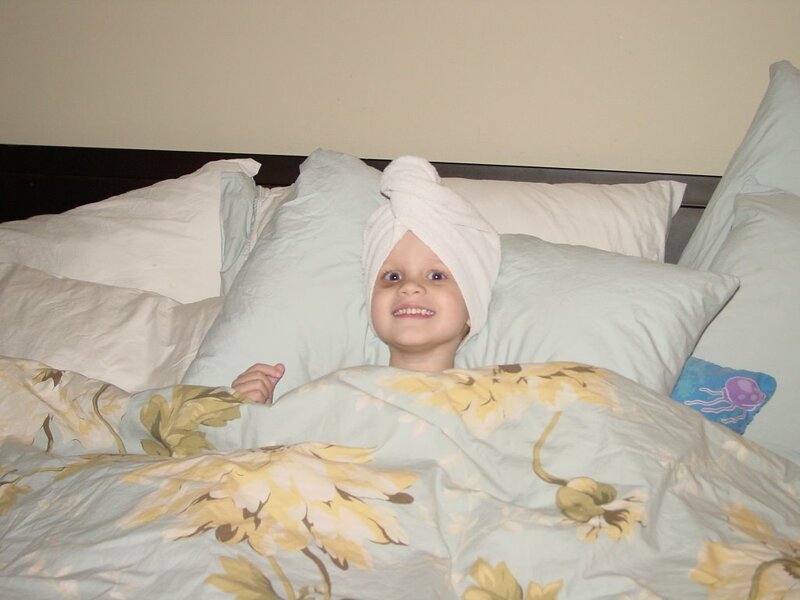 We know she will not go into remission as a result of these drugs; however, we hope and pray that it really destroys most of the neuroblastoma cells while not being as hard on her as we are preparing for. C-Exactly what are you afraid of, Mom? C-Let's watch the others. See! They barely get wet when they land. Anything else? A-Going too fast down the slide and flying out. C-Look! There are people bigger and smaller than you and no one flies out. Well, off we went - three big water slides, one water rollercoaster, one happy child checking on me (What do you think, Mom? Isn't this fun?) and one scared mama.....so happy I now have those memories to treasure! Thank you, dear Lord! Although extremely anxious to return to Philly on Friday and although with a heavy heart this morning with anxiety about what is to come this week, Shayla and I are now heading off for a day of school. Here's wishing you and yours a great day!! As you can see from the pictures, the waterpark was absolutely, positively fantastic! To say that we had a glorious time is an understatement! It was very hard to leave this morning. Upon our drive to the airport, Shayne and I glanced back and saw Christi curled up in her seat with her eyes shut and with a single tear streaming down her face. She didn't want to talk about it, but it is of my opinion that she's old enough now to know what she's missing. When Shayla and I hopped out at the airport tears literally gushed out of my eyes and I held and sobbed into this little girl's beautiful bald head. I know how much she wants to attend what should be her final week of school too. This week and the following one will be anything, but pleasant and it's going to be gut-wrenching to be away from her when I know she needs my comfort and love. Thankfully, they are checked into a room on 3 South, oncology. This will allow us to use the web cams so that I can at least see her and everything happening in her room. That will help comfort me. Sweet Sylvia and her beautiful daughter, Michelle, caught us at the aiport. It was so nice to finally meet these amazing prayer warrior in person! When I heard my name being paged I thought something fell through since we were only flying "stand by" but instead it was a very sweet surprise! My deepest thanks to Jane for driving Shayla and I home from the airport this afternoon! Shayla only chatted a little bit before sleeping the rest of the journey. I'm so glad as it was absolutely wonderful to finally catch up with Jane. Tomorrow, Shayne and Christi will drop Shayla and I off at the airport at noon for our 2:00 PM flight and then they'll go check in at CHOP for her seven day stay. Shayne's sweet cousin, Corrine, and her husband will be staying at the Ronald House and helping Shayne throughout the week. Here's wishing you sweet supporters a great day - SPLASH.......from the Thomas team!! 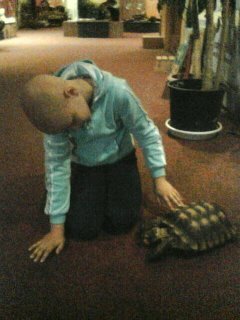 Tonight we had a special visit here at the Ronald House. Jan and Larry drove into the city to entertain us. We sat in the kitchen and played games. 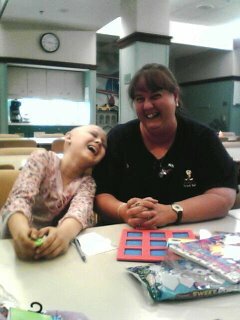 Christi is feeling great and I loved watching her laugh as she won (and lost) some games. Larry won "LCR" - three times and even took his own picture! Christi thought it was so funny she laughed herself off her chair and right onto the floor! (She's fine; actually, she never stopped laughing!) They brought Christi a darling pair of summer kitty PJs and the softest socks - two things Christi was lacking this trip. It appears that minutes after I posted my plea of needing a lift home on Sunday, a sweet Chrsiti supporter I used to teach with emailed and offered to bring us back! Thanks be to God for prayers answered! I'm looking forward to catching up with Jane and learning what her new wschool is like; she was always so curtious and pleasant to work with. My colleagues are the best! Shayne and Shayla should be in Pennsylvania by now. We expect them to arrive about 1 AM. Christi has been hard at work finishing her Father's Day present she started yesterday (two pom pom craft dogs) and she drew him her finest card ever - thanks Traci for the book about shading; I can't believe how quickly she's picking it up. 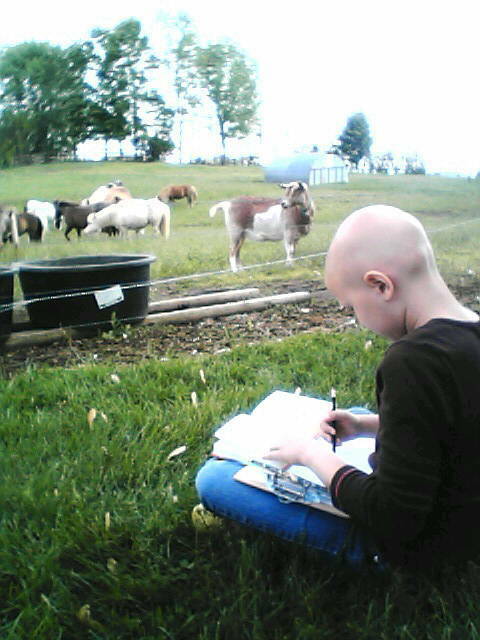 The animals she's now drawing are so realistic. Christi wants to give him his Father's day present tomorrow and considering the consent forms along with the many possible side effects, including death, that I signed at the hospital to authorize the "treatment" (torture) that's to begin on Monday, I think it's a good idea. She's feeling so well right now, it's going to be very hard to put her through this knowing the side effects and knowing how ill it's going to make her. I've already started my prayers that her stem cells, which will be transplanted back in her on Friday, will quickly engraft and bring her back to life. Lord her our prayers! Thanks Jane for picking up the girls on Sunday. Shayla will surely keep you hopping with conversation. 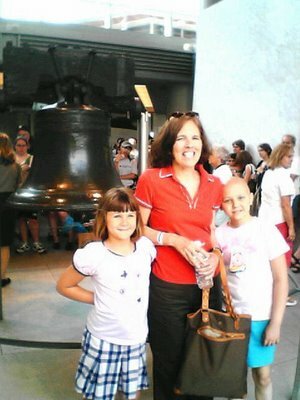 As you can see Christi and Angela are keeping busy in Philly today. 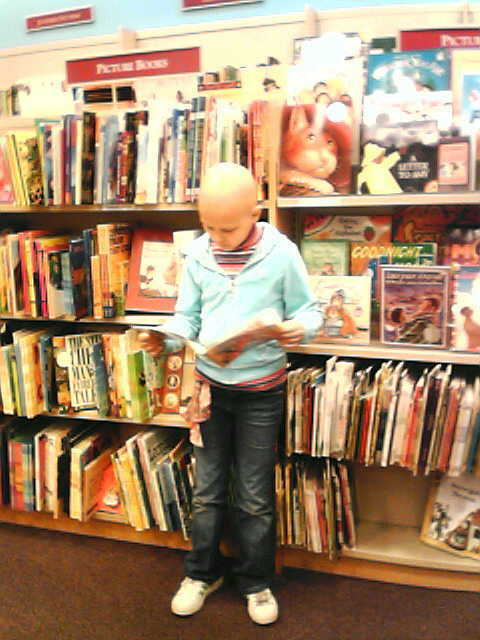 She is feeling great so we are going to find something fun to do this weekend. Anyone Able to Pick Up Two Hitchhikers? Shayla and I will be arriving at the Cleveland airport on Sunday afternoon. We need a ride home. Anyone up for a Sunday drive? (Yikes, who has time for that??!!) Sorry, anyone willing to give us a lift home? (I'm begging!) I'll gladly pay for your gas. My email is now set up, so please email dear family/friends who may have the time to bring us home. THANK YOU! Now what do I pack to keep Christi comfortable and entertained for 7 days in the hospital?? 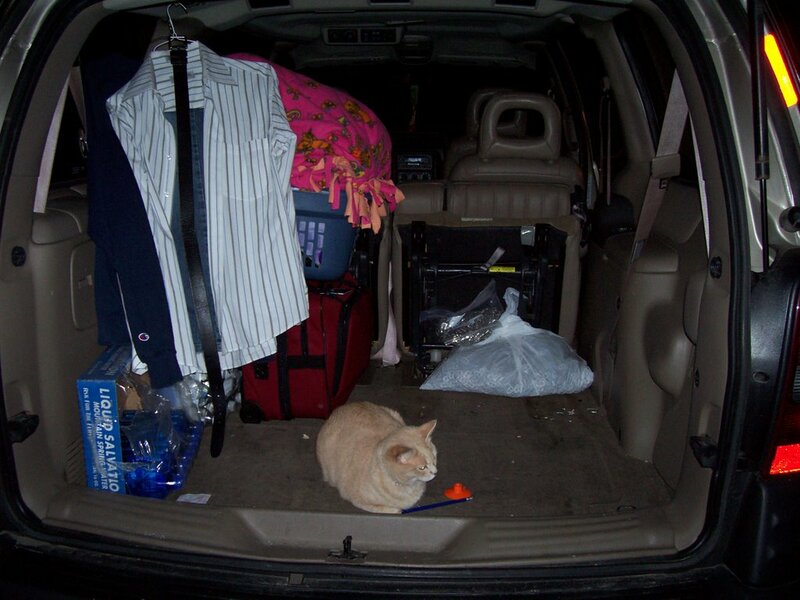 6 pillows-check, all the stuffed animals from her bed-check, board games she got for her birthday-check, cat-errr uhhh I think it loaded itself in the van. I'll update just as soon as there is a "Plan B". Currently, we're still trying to make arrangements. Meanwhile, we have been blessed with a room here at the Ronald House and I think the sweet Trauno's summed it up best, even though it made tears of disappointment and laughter at their comments fall at the same time. "Better to be on the ground wishing you were in the sky than in the sky wishing you were on the ground." So true! They are so sweet! Rich even called and left the sweetest message. They know how much Christi wanted to be in school tomorrow for her last day. When the phone call came about 10:00 AM this morning that the wonderful Mr. Warren couldn't make it due to weather, Angel Flight said they called Rich Traunero and she thought he'd be coming to get us at 4:00. With beautiful, clear blue skies and warm temps I was hustling outside about an hourlater to get Christi's requested food: mushroom soup and a green apple for after her procedure. What a shock to learn that the weather simply wasn't going to cooperate for us today back in Ohio. She sweetly said he offered to get us tomorrow. I explained that we were just going back for me to get in another day of work and to have Christi have her final day of school, she was going to be coming out here on Saturday anyway so we'd just stay put and figure out a way to get me home later. Christi has to stay, so we set up an Angel Flight home for Christi, Mrs. Smith- her teacher and our dear friend who will be helping us out the second week here, and myself with Rich on June 2nd. God willing, that will happen. So I "think" Shayne and Shayla may be driving out with all of our things late Friday night. Now I just need to find a way for Shayla and I to get back to Ohio on Sunday night for our final week of school. Christi has said many times today, "I just wish Shayla were here to play with." Well, we know exactly what's going to be happening to Christi in a matter of days so we're trying hard to grant all her wishes! Thank you to the sweet Angels who sent a package to the Ronald House for Christi to receive upon her arrival!! That brought her more joy than you'll ever know!! May God richly bless you! Looks like the girls are not going to make it home from Philly tonight. The storms have disrupted their Angel Flight. We are scrambling to develop a plan B.
Greetings from the airport hotel! As you can see from the pictures below Christi had a jam packed day! "Wacky Wednesday" was enjoyed by the girls at school today. 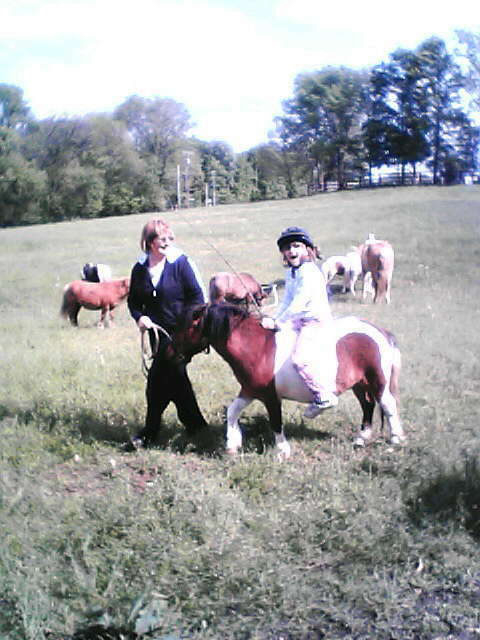 She had a glorious time playing "Amazing Labyrinth" with her fellow fourth graders then it was home to pick up Nee Nee after school for the "Pony Express". At Aunt Marty and Uncle Jeff's she enjoyed visiting with their goats, cats, dogs, and many ponies. Christi was allowed to name the new one so she needed to sit and observe it and sketch it before making certain the name she selected was the perfect fit. She came up with "Morning Dove" for the new white pony. Uncle Jeff and Aunt Marty agreed with her selection. 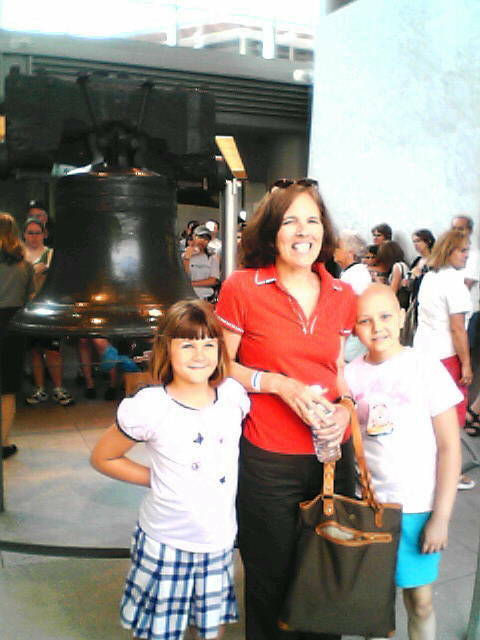 Aunt Marty took us to the place where Christi learned we were meeting "Ms. Weaver". Christi asked if she knew "Ms. Weaver" and I told her she's been a friend of mine for years and she would probably remember her once she saw her. (hee hee) As we walked into "Magic Mountain" she asked what kind of place it was. She was THRILLED to see Traci and then even more pleased to learn that we weren't really just catching a ride there, but able to stay and play for a few hours! THANKS TO ALL OF THE SWEET FRIENDS, mostly from COSI, who spoiled her with Magic Mountain's games, go-carts and play place. Traci and Jason brought us back here to the hotel where we enjoyed the birthday cookie they surprised Chrsiti with. She had a blessed day! (Amazing to me: we've had days of cold, rainy conditions. 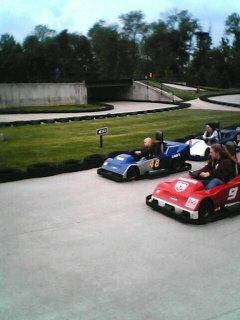 When it was time to go out to the go-carts it was sunny and warm. Praise be to God! It was like He parted the storm to allow Christi to have her first attempt at driving a go-cart! Then when it was time to leave we drove in the pouring rain to the hotel.) We've been blessed! THANK YOU ALL! Goodnight! PS: The pics of her holding the "critters" were taken a few weeks ago at COSI. The rest are from today. Our school is having "Wacky Wednesday" today. The girls were really into it, selecting their own clothing. After school we'll stop by and pick up Grandma Nee Nee to get started on the "Pony Express" mode of getting Christi and I to the airport. Nee Nee will drive us to Aunt Marty's. Aunt Marty will drive us to Columbus where there will be a special surprise waiting for Christi! (Hint: We love our COSI friends and they're fun and crazy when they're off work too!) Later, our COSI friends will drop us off at the airport hotel where we spend a short (Have to be at tha airport before 4:30 AM Thursday) night. PS: Christi continues to feel very well. She attended one hour of jazz followed by one hour of ballet and 15 minutes of pointe work last night - Praise the Lord! 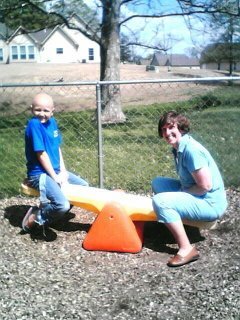 PHOTO: "Christi plays with the wonderful Anne Newhard at the Betty Jane Preschool" Christi loves visiting the incredible teachers where she attended preschool just four short years ago. She often asks to visit, yet our schedules typically don't permit it. It finally worked out about ten days ago when we stopped on the way to the hospital for a transfusion and she had a ball! We miss the amazing teachers and staff (seems like family) at BJP and wish them all the very best! Last night Christi sat on my lap and I went over her schedule for the next two weeks. 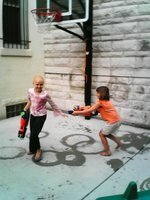 For the first time, I explained that she would not be permitted to attend the entire last week of fourth grade because she'd be receiving high dose chemo at CHOP. She tried her best not to cry, but soon she couldn't take any more, she buried her face into Buckeye, sitting lovingly in her lap, and then I hugged her while her little body shook and my tears dripped down on her bald little head. I know it was so hard for her to hear this as her class has been planning the foods they'll eat and the games they'll all bring in for their final day together and now she knows she cannot be a part of it. 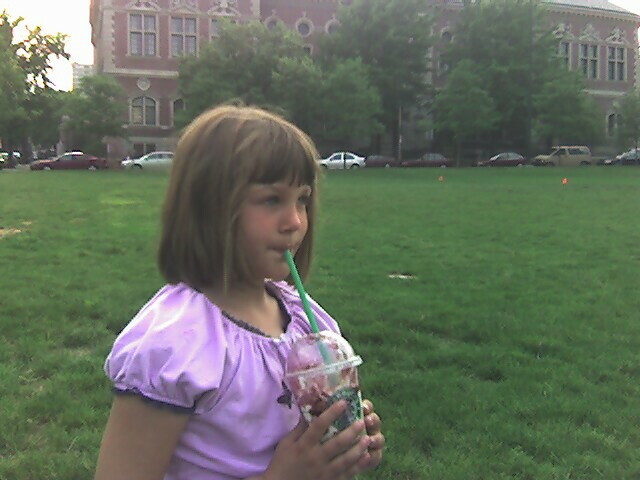 HER last day of fourth grade will be this Friday. She told me, "It's just so hard.” I couldn’t agree more. A mother is to protect and I feel totally helpless and out of control. Shayne and I hate for her to have this disappointment; yet, we are very grateful for Dr. Maris waving his magic wand and getting her scheduled so soon and at a time when he will come over and see her himself every day and be the one to infuse her stem-cells back in her like he did in January of 2004. Another alternative was to wait about six weeks for BSO/L-PAM until mid-June when he would again be available. He said we could put her on oral VP-16 to try to hold the disease until mid-June. Well, my face must have turned white because he said, "I know what you're thinking and it wouldn't be used for that in this case." (Kids are often sent home on hospice and take VP-16 to try to slow things down a bit and to give parents more time with the child. It does not halt the disease.) Regardless of how hard my talk was with Christi about missing the entire last week of school, she once again amazed me with her compliance and I said I’d email her teacher to see if some special things could be planned for Friday. This morning we had her blood counts drawn from a vein in her arm early at the hospital before heading to school. 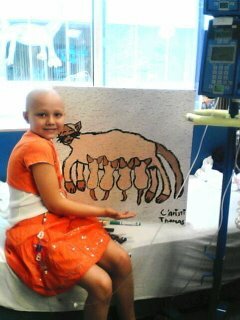 While the news wasn’t surprising, it was disappointing – she needed yet another transfusion, ugh! (This will be her sixth life-saving transfusion in the past fifteen days!!) Do blood donors know how much we appreciate them sharing their priceless gift? We do! Christi would be dead without them! Therefore, just as we did before school, we went to the hospital after school for Christi’s platelet transfusion. The transfusion was less than four hours then as Shayla and I went to leave the hospital, I noticed the flat tire on my van. That sweet and amazing husband of mine who stopped by the hospital after work to bring the girls "Taco Bell" sent us home in his warm truck after the long time spent at this hospital while in the cold rain he pumped up the tire enough to get to the store. Now my van is sporting a new tire. The biggest disappointment of the day in my book was the fact that her LDH is again higher and above "normal". It's such a good indicator of the cancer circulating in Christi's body. Some have asked what tests she has to have done on Thursday. A 24 hour urine catch is required so I'll be traveling with that (Oh, the security folks are going to love me, hee hee!). She'll have to go without eating again as they'll put her under for her bone marrow samples to be extracted from her pelvis. She'll also have a CT of her head. (The children who have died had brain involvement. If Christi does this would make her ineligible for the trial.) She'll also need an ECHO done to measure her heart function. In preparations, starting today we are no longer allowed to give her any antibodies, Tylenol or Motrin. (Again, this is something the children who died all had in common so they are not permitted two weeks prior the trial and again not permitted during the study either. That's when it could get tricky in my opinion.) She's now with the sniffles so I pray she can shake this on her own and not require any meds. 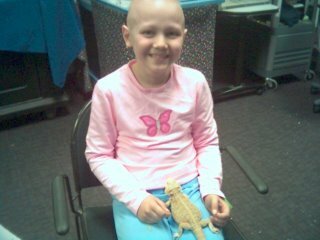 Thankfully, Christi continues to feel very well and she had another fabulous day at school with her friends and her amazing teacher, Mrs. Smith. We pray tomorrow she is again blessed with feeling well!